The modern-day population is swiping its way to pretty much everything –shopping, banking, music, movies– you name it! Besides, the fact that people do it all on their own devices gives it that personal “touch” as well. Learning and Development (L&D) departments the world over recognize the power of this medium and are looking to “tap” (or “double tap” if you like) into the potential it has on offer. We have used mobile learning apps for varied requirements from microlearning to supplementing primary eLearning or ILT programs (learning aids or Performance Support Tools) as well as for assessments. What Are Mobile Learning Apps? As the name suggests, mobile learning apps are a delivery format that provides learners with the flexibility to learn anywhere, anytime, even without internet connection. A mobile learning app lets you view your learning content offline from your mobile device. You do need internet access to download the course though and so is the case with tracking the progress of learners through the Learning Management System. Given this flexibility, they are fast emerging as an important training delivery format, particularly for microlearning. What Are The Advantages Of Using Mobile Learning Apps? The benefits range from its suitability for people on the move for offline and online viewing, popularity with millennials, and high completion rates it commands. Probably the most significant advantage is that mobile apps provide access to just-in-time information within the learners’ work-flow dramatically increasing its usage at the time of need. Also, the possibility to push new content on the go makes it an effective tool for performance enhancement. Where Do Mobile Learning Applications Find The Right Fit In Today’s Learning Strategy? 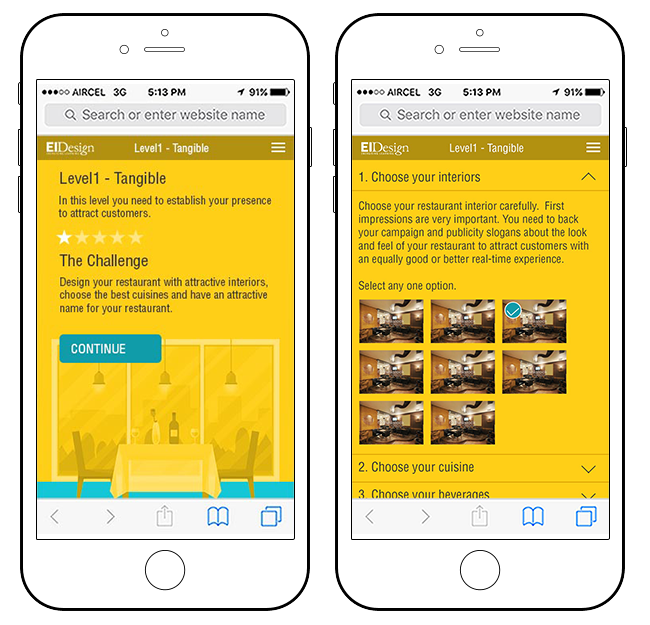 Mobile learning apps can serve as your double cheeseburger as well as the little beverage pack that goes with it – you can use it to offer bite-sized formal training or as a supplement to formal training. They are also an ideal fit when it comes to just-in-time learning aids and Performance Support Tools or PSTs (such as Ready Reckoners, Checklists, Tips, and so on). These PSTs are designed keeping mobile-compatibility in mind and making them available on mobile devices to learners when they need them the most just makes performance enhancement on the job that much better. They can be used as microlearning nuggets considering the short attention spans learners tend to have when using mobile devices. 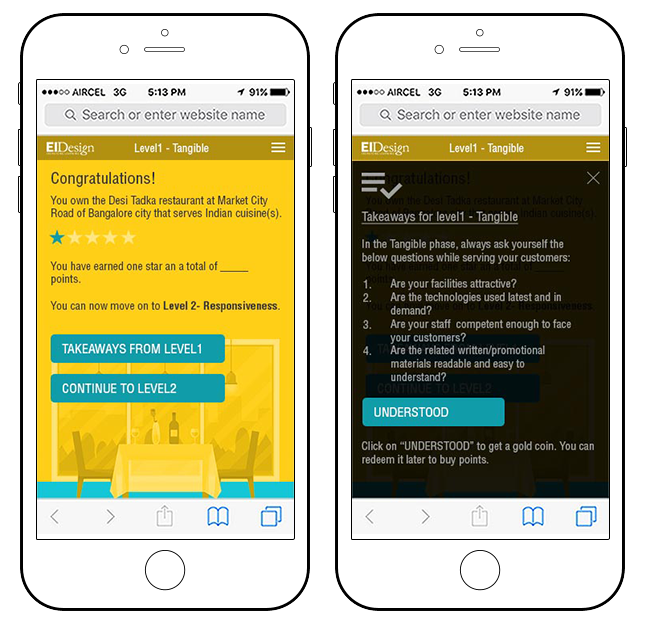 I will now share a case study that features an assessment-based microlearning nugget that we delivered as a mobile app. Background: eLearning solution at EI Design is targeted at users who are always on the move and depend on their mobile devices for their digital learning needs specifically when it comes to engaging and interactive content. 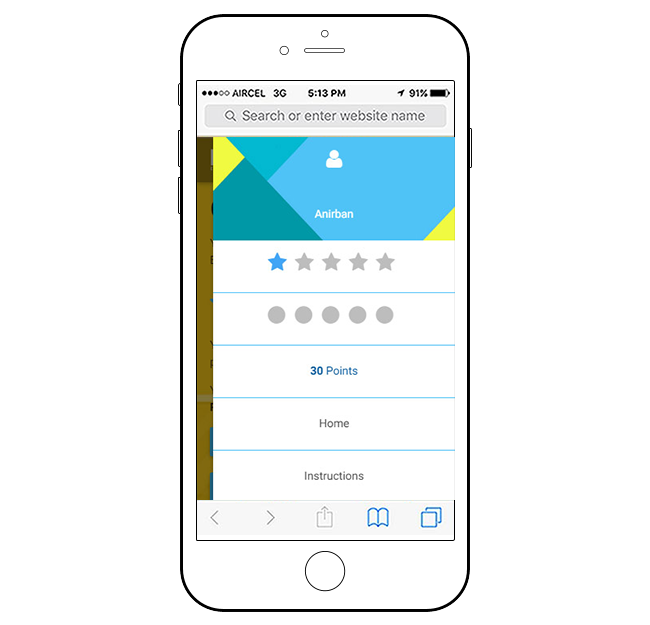 Our mobile app features an assessment game which serves as an assessment module for the learners as part of a larger learning program. 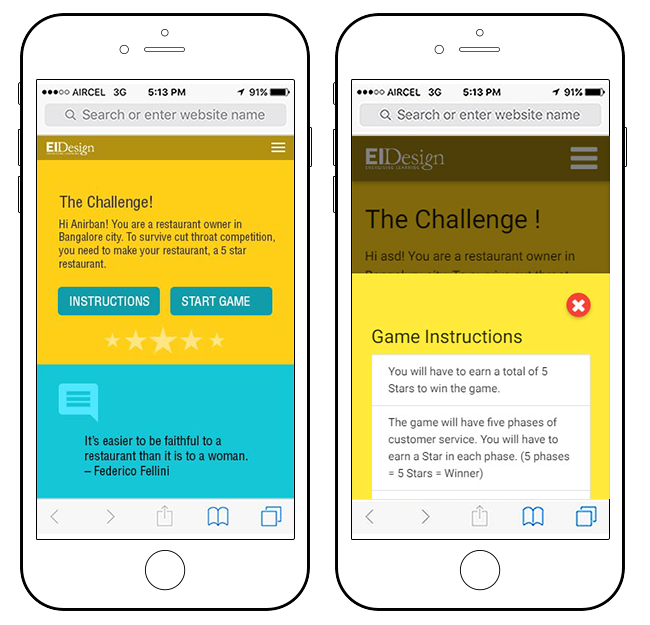 The design is very flexible and the facilitator can push various quizzes and assessment games into the app to check the proficiency gained in various topics/modules covered in the program. The app is compatible with iOS, Android, Windows, and BlackBerry devices. Your ability to provide a quick and high quality service to your customer. Your ability to use your knowledge, skills, and credibility to inspire trust and confidence in your customer. The quality of physical evidence of the service you provide, such as infrastructure, staff, marketing materials, and so on to attract the customer. Your ability to understand your customers and the quality of relationship you share with them. Your ability to provide the service you have promised consistently, accurately, and on time. The game has five phases mapping to the five ways to measure service quality using the RATER model. The learners have the chance to earn a star in each phase (5 phases = 5 Stars = Winner). The learners need to score 100% to get a star and move to the next phase. At the end of each phase (irrespective of whether they get the star or not), they are given reference material to read through about the particular phase. If they confirm downloading the material, they earn bonus points which they can redeem in the later phases of the game. 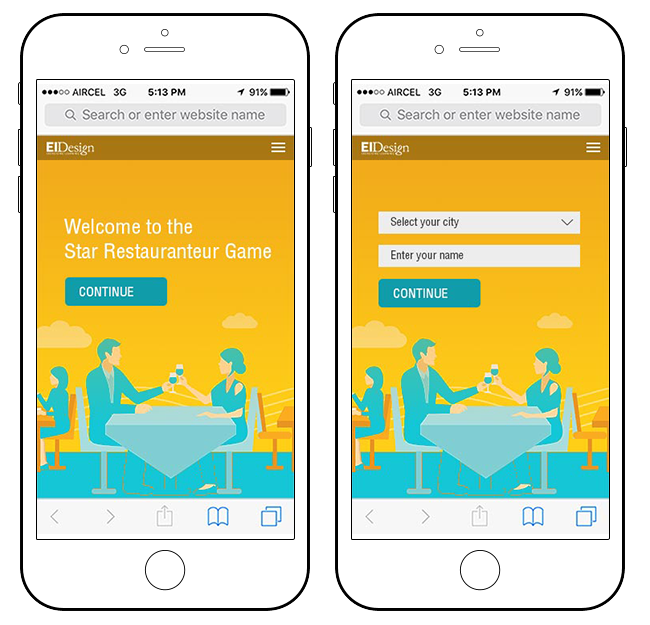 The content of the RATER model is overlaid with a restaurant theme where the learners need to take up five challenges related to the RATER model and build a successful 5-star rated restaurant. The welcome screen followed by the credentials screen. The game challenge is defined here along with instructions on how to play. The first challenge for the learners is shown here. On successfully attempting the first challenge, the learners get a star and points. Additionally, they get to read reference material related to the first level challenge. On clicking the button to read the reference material, they gain bonus points in the form of gold coins. I hope this article was useful in helping you recognize the power of mobile apps for learning and the impact it can create. If you have any questions, do contact me. Asha, does your company design the mobile application? If not, do you have some you recommend? Learners do want this type of ease of knowledge at their fingertips.